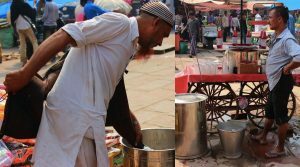 The corner from where the last-known practicing bhishtis (water carriers) of the old city of Delhi operate is hidden behind a tea stall near the eastern staircase of the Jama Masjid. It stands amidst swarms of crowds emanating from the adjoining Meena Bazar. 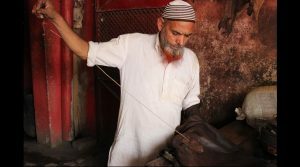 The makeshift workshop can be recognized by the traditional goatskin water bags called ‘mashaqs’ that adorn the two adjacent walls of this corner. These final bearers of the forgotten mashaq of Old Delhi, comprise three brothers — Mohammad Jameel, Khaleel and Shakeel. Occasionally Khaleel’s son, Mohammad Rasheed, would help. As one of the oldest surviving professions of Delhi that now face extinction, these bhishtis are like breathing relics of a world gone by. 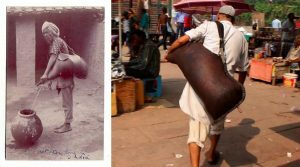 Today, the idea of a man carrying water in an animal skin bag from a well sounds unusual. While not too long ago (till the 1950s and ’60s), this same man was an intrinsic part of the social landscape of the city of Delhi. Both, under the Mughals as well as the British, bhishtis were indispensable as they were employed by the state to provide water to soldiers. Rudyard Kipling’s eponymous poem, Gunga Din (1890), despite its racist lingo, underscores the absolute necessity of the bhishti for providing basest sustenance to British troops in India’s “sunny clime”. ‘You ‘eathen, where the mischief ‘ave you been? ‘If you don’t fill up my helmet, Gunga Din! Go further back, and it is said that a bhishti once saved the life of a drowning emperor Humayun, was given kingship for a day in reward and issued the legendary leather coins, while another legend talks of the heroic deeds Hazrat Abbas during the battle of Karbala. Curiously enough, the three middle-aged brothers continue to pursue a profession that has almost become redundant, replaced by more feasible access to water — from taps to packaged water. One reason that Mohammad Jameel offers for their tenacity is that they are khaandaani bhishtis — this is all that they have inherited from their forefathers. Mostly illiterate, otherwise unskilled and poor, the trio find other livelihood options such as daily wage labour unappealing. 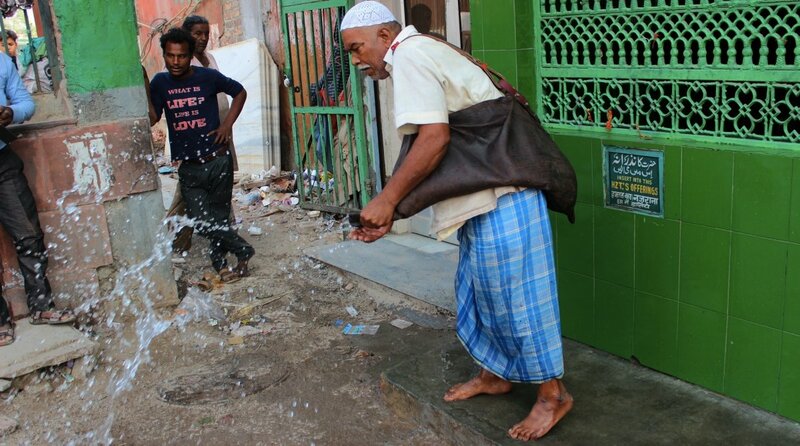 Jameel also likes to believe that this is a virtuous job; that to “quench the thirst of the needy” is a noble deed and he is bitter over the reality that people don’t give it due reverence. It’s also hard labour, as the bhishtis run to and from the well, carrying a mashaq with 30-odd litres of water each time. 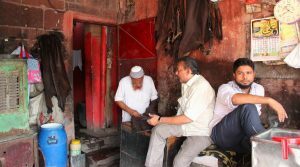 Jameel recalls stories of how bhishtis were once a respected community during the Mughal period as well as the British era, but “ab zamana badal gaya hai (now, times have changed)”. 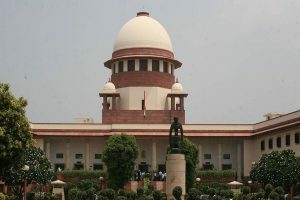 The perspective began to change with their receding relevance thanks to technological advancements, and when they started working under Indian governmental organisations — such as the municipal corporation — which categorized them withbhangis (sweepers) to clean drains. Over time, the bhishtis were associated with lower castes and considered ‘unclean’. However, while it is true that bhishtis were given more importance earlier in accordance with the significance of their services, they always belonged to the lower rungs of society. Some of the old pictures of bhishtisfound in British archives are titled, “Giving a customer a drink without physical contact,” plainly indicative of their class and caste positioning in society. Caste differences, though scripturally codified in Hinduism, were very much a part of Muslim households too in the Old City. Divisions were occupational (biradri system) and communities were divided into high (shareef) and low (razeel) castes accordingly. Bhishtis, today, feature on the Other Backward Class (OBC) list. These last practitioners of this dying profession in Old Delhi are now relegated to primarily delivering water to the nearby street vendors and hawkers. Or at times a person will pay for distributing drinking water for free to thirsty passersby as charity. Sometimes they are sought by nearby houses when there is a scarcity of water, on others they are hired to provide water for cleaning shops. 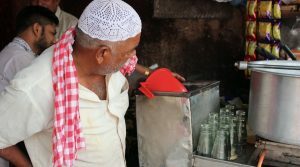 Summer usually means more work as they are often asked to do chidkhav (sprinkle water) to assuage the sweltering heat of the dry and dusty city or fill water coolers in market shops. Winters are usually very hard. Festival season — such as Ramadan and Eid — also translates into more opportunity but other than that work is scarce and earnings meagre. They charge around Rs50 per mashaq. Frustration is evident and their children have taken to other professions, unwilling to pursue a physically taxing job that has barely any returns. Slowly vanishing from collective memory, the bhishtis of Shajahanabad once performed important domestic functions and an attempted recuperation of their history provides fascinating glimpses into the mundanities of everyday life of the old city. A resident of the old city, Farhat Ara shares a very insightful incident from her childhood in the 1960s. Now in her 50s, she recalls that a bhishti would deliver water to her ustanji‘s (female teacher) house in Gali Jootewali. Interestingly, the man would only enter the house with his face covered with a cloth and then pour the water into big ghadas and matkas used for storing water, a habit that the children found very amusing. Further, the money that he was paid was given to one of the children by the ustanji, who herself never came out of the inner quarters in his presence, in accordance with the purdah system that most women observed. However, an added reason for the bhishti covering his face could very likely be that he belonged to the lower rungs of the social ladder. Nevertheless, like most other professions in Old Delhi, they had established relationships with specific households unlike the alienation that a modern urban landscape entails. For instance, it is singularly intriguing that people were particular about which well’s water they drank. Every mohalla would have its own well and bhishtis delivering water would often announce the specific well they had drawn it from as they made their presence felt by beating their tambe ke katore (copper water cups) against each other. Eventually, however, wells went out of use. Some dried up while others got corrupted. Taps are not an option, and now there is just one surviving well in the area. Sohail Hashmi, a well-known culture and heritage enthusiast of Delhi and a former resident of the old city, recalls his memory as a young kid in late 1950s visiting his phupho‘s (father’s sister) house in Farashkhana. Hashmi recounts his aunt specifically ordering for “burme ka paani“, a hand pump attached to the local well of the mohalla. A bhishti would then deliver from the specified handpump known to have ‘meetha paani’ (sweet water). He fondly remembers her expostulating, “bachchon ko nalke ka paani pilayenge? (will we make the children drink tap water?)”. Therefore interestingly enough, in a lot of households, municipal tap water was still not considered a ‘good enough’ source of drinking water; people would prefer traditional wells instead. 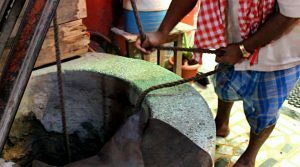 Tap water was instead, extensively used for washing clothes, utensils, vegetables, etc. Another interesting conception that the disappearing bhishtis bring to the fore is the commodification of water. Today, the idea of buying a bottle of water is the most ‘normal’ of things whilst barely any time ago, water, which is the ‘source’ of life wasn’t something that you ‘sold’. And it was socially accepted that water, which is fundamental to human existence, was something you didn’t even deny your ‘enemy’ and families of the old city would often keep matkas of water outside their homes for thirsty travellers. So, with the acceptance of the imminent retreat into obscurity of the last set of bhishtis of Shahjahanabad, my conversation with Jameel came to a close. We silently sat for some time in the Hazrat Sayed dargah complex, close to the Jama Masjid, brooding over our cups of tea, brewed in the water drawn from the very well that we were just talking about. And as we mulled over the peculiar end to a most human effort, amnesia, we could hear a famous Sufi song being played in background from a tiny box-shaped TV in the adjoining bookshop and it seemed to be mulling with us too. This is an edited version of an article by Sahapedia-UNESCO 2017 fellow Yusra Hasan on www.sahapedia.org, an open online resource on the arts, cultures and heritage of India. Sahapedia offers encyclopedic content on India’s vast and diverse heritage in multimedia format, authored by scholars and curated by experts — to creatively engage with culture and history to reveal connections for a wide public using digital media. Hasan is currently pursuing a Master’s degree in mass communication from AJK MCRC, Jamia Millia Islamia.